If your sofa is a synthetic material or ANYTHING other than cotton, hang up the vinegar and don’t try this at home – call BCS immediately to schedule your professional cleaning. If your sofa is cotton, spray the tea stain with a vinegar mix (one teaspoon white vinegar in one liter of water) and allow to sit for ten minutes. Then simply blot and rinse well with plenty of fresh water, before washing removable cotton covers as normal. Be sure to air-dry. 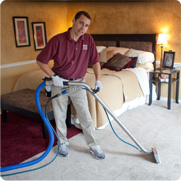 If the stain persists, it’s time to call in the pros at BCS – call us at 801 561 1730.